Large floes meet the warm current and warm(ish) winds on the ice edge north east of Svalbard, dec18-20 (19th cloudy) The large floe in the centre right on the 18th is was ~20km top to bottom. Floes are disintegrating as they enter this warm water. 967hPa forecast for north west of SZ tomorrow. Ice on the western corner already looking quite weak. I couldn't figure out a good way to normalise this to area-of-the-sea-of-interest so there is a bias in the size of the bars to some extent. Nice graph. I think the absolute anomaly in km2 is okay, I don't see it as biased. Another retreat event in the Kara. No wonder extent gains are slow, despite relatively rapid gains in the Bering. Wind will push ice to Svalbard for the next 5 days. AMSR2 image for 3rd December contrasted with present extent line (in orange). The front has extended slowly south in the vicinity of Svalbard but it's tough going against the west Spitsbergen current. Meanwhile the retreat in the Kara is around 200km long ! Yes, the ice front may make it across to Svalbard over the next few days. A 974hPa cyclone over the Kara tomorrow might spread the ice around a bit. Wipneus regional sie, Kara, dec29. Ice on the Atlantic front reaches the Svalbard Islands. Yes finally ice beginning to arrive at the north coast of Svalbard. Today's image from the Norwegian Met shows fingers of 1-4/10 ice reaching the north coast of Spitsbergen (the western island). Although I wouldn't quite call it an end until I see the 9-10/10 ice arrive. The last time very close drift ice reached the north coast of Spitsbergen was July 2017. That's almost 18 months ice free. The area to the east of Svalbard should really be all ice covered at this stage but is taking an interminably long time despite air temps being -10 C to -12 C for the past while. Agreed. The ice north and north east of Svalbard looks fragile. The wind is forecast to change jan2. Around Svalbard the winds have been more or less constant from the north for the last 10 days or so but that seems about to change, with the first warm gust of 2019 hitting on Wednesday. Whether it heralds a change, or is a one-off, I couldn't say. The low-pressure areas coming up the Atlantic seem to have been deflecting towards the east before hitting Svalbard, but playin ravage in the Kara instead over the last weeks. The ice may be drifting south but I think I see evidence of melt all along the edge from Franz Josef to Svalbard. You can see large ice flows on the leading edge breaking up and disintegrating. What are the SST's here? I think I see evidence of melt all along the edge from Franz Josef to Svalbard. You can see large ice flows on the leading edge breaking up and disintegrating. What are the SST's here? There is a fairly thin line of Sea Surface Temperatures, between the island groups, that are warmer than normal, ~ 4(?) degC. I'm just looking at the Northern Hemisphere, so its not high resolution. though it hasn't surfaced since dec14 (or batteries may be flat). On a brighter note, Bering sea is freezing. There's a major SSW- Event underway, gonna split the Polar Vortex into bits. We could use a bit of WACCy weather in Scotland at the moment. I have never seen such little early-season snow in 10+ years of winter climbing (there is none below 3500ft). I'm actually hoping the split aims some of the cold air at us, though that's rarely the case. It's going to be a snowy January in the NH continents, in many areas of mid-high latitudes. Dec 2018 ended with average snow cover per Rutgers lab, expect a ramp up for the next month or so. Anything to expect over the Arctic proper? Effects of past SSWs in Jan/Feb were very disappointing in any aspect apart from some spectacular cracks due to the ensuing anticyclone. I guess we need to be analyzing in 4D here. This Cold leaving the Fridge now, will be very much missing in Spring/ Summer in the NH. Last Season we had summer Temps from 8th April til first Week of November, with very little Precipitation. This Year's gonna be more of a Scorcher. December 27 - January 3. It seems that the increases in the last few days are mostly on the Atlantic front, with the ice being pushed and dispersed by northerly winds. This situation could change quite fast, but the forecasts are a bit hither and thither and difficult to interpret for an amateur. But if the winds do turn, the Atlantic front could be pushed back quite a distance, including in the Kara. This wind driven advance may be overstretching the pack a little. Hopefully the refreeze will keep up. edit: viirs has been available since sep17 so added jan4,2018 for comparison. More ice (extent) but probably thinner, particularly in the Lincoln sea (left). edit: Though Tealight has Lincoln Sea at 3m so perhaps not thinner. All of the peripheral seas also increased in extent yesterday. 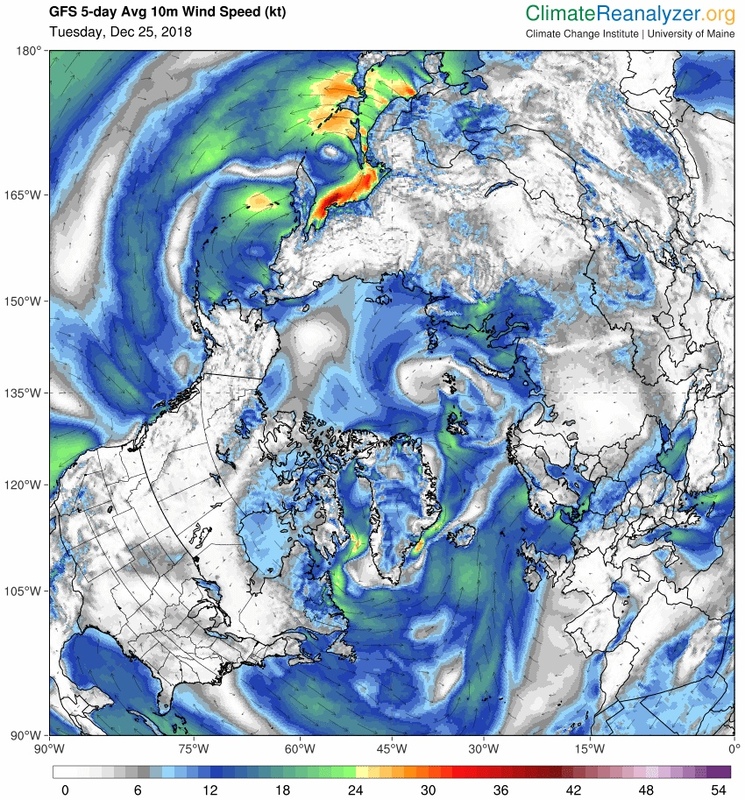 With the new moon on sunday we may see Atlantic waters accelerated once again into Kara, north of Svalbard and across the Atlantic front, with the ice driven back [melted?] once more. What is that prediction based on? The Farmer's Almanac or Old Farmer's Almanac? Also a good view of the Bering Strait today on Worldview, viirs,bt15,night. It's not a Predicition, it's Common Sense. The warm current apparently still at work under the ice north of FJL. Less cloud today. worldview,viirs,bt15n, northFJL, jan7-8. Hopefully ice on the Pacific side will be less mobile now the Bering Strait is plugged. The Beaufort arc of older ice bifurcated at the Chukchi while there was open water. The atlantic ice front made it to Svalbard only to be pushed back, possibly temporarily. Fast moving, quite fragile ice in the Greenland Sea due for another pounding tomorrow and 957 949hPa cyclone gfs forecast for thursday before thicker ice from the CAA makes its way across in the next few days (see Tealight https://forum.arctic-sea-ice.net/index.php/topic,2268.msg185799.html#msg185799). hmmm. 11m waves, >90km/h wind forecast along the Greenland sea ice front on friday. Like Meddoc (sort of) says, maybe a large short term extent gain coming. That's an amazing pressure gradient, the Fram will be subject to it. Assuming near 100 km/h and that the floes will pick a 25th of that speed, that is 100 km/day for the ice approx. Maybe I am erring on the high side, but will be interesting to observe. Still very slow going around Svalbard. In fact the ice has been pushed back well north of Spitzbergen, again. Indeed, and I believe some of the push back is actually strong melt, as evidenced by movement of coarse features compared to the speed of retreat, especially on the last frame. The Atlantic is fighting back. The cyclone in the Greenland Sea -> Barents will probably drag a lot of ice (and cold air) back towards Svalbard. agreed. Polarview, svalbard, this morning. Sorry, not much ice in this image, mostly wind blown slush. https://www.polarview.aq/arctic for more images. As an anomalous cold front sweeps over the North Pole, the DMI temp, above the 80th parallel & biased to the north, shows a strong drop, even with warm fronts also above the 80th parallel. Forecasts predict the cold front will move off the North Pole. We'll see if DMI temperatures will rise later. Pretty sure that's not ice round Jan Mayen. Dense cloud perhaps. Some goodbye waves visible to the far left of the polarview image. Or is it the Odden Ice Tongue? That would be pretty amazing. A blast from the past. Current and potentially sustained anomalously cool ocean surface conditions for the next few days in the Fram and southward. Could this be a totally unexpected (brief) return of the Odden?